Marty and Daisy spend their lives pretending. Marty pretends his mum's grip on reality isn't slipping by the day. Daisy pretends her parents aren't exhausting themselves while they look after her incurably ill brother. They both pretend they're fine. But the thing about pretending is, at some point, it has to stop. And then what? Eve Ainsworth writes really heartfelt and beautiful books which are incredibly thoughtful. I thoroughly enjoyed her previous books so had really high hopes for this and I'm please to announced that this was as good as I hoped. 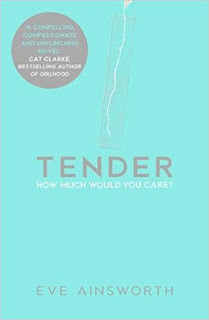 Tender is the story of Marty and Daisy both of whom are struggling acting. Marty's mum clearly has mental health issues which aren't being addresses and Daisy's parents are totally focused on her younger brother who is terminally ill. Both of them are trying to go on as normal but doing that is hard. For me this book really made me feel for both of the characters particularly because I suspect I know several kids like them but because they hide it well like the characters in the book I don't know about it. The character of Marty really got me seeing how the issues he's facing are really messing up his entire life by making school all but impossible. All in all a brilliant and heartfelt book that really made me think.